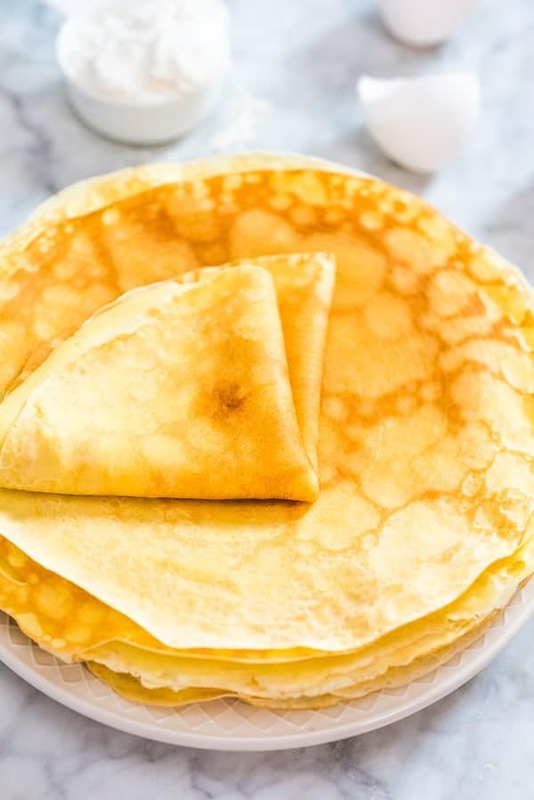 This is a simple, foolproof, and tasty Sweet Crepes recipe. Follow my step-by-step photos or video instructions to make this scrumptious treat at home. There has been enough said about Sweet Crepes. We get it. They are good. Growing up in Ukraine, we had crepes pretty often on our family table. Usually, they were stuffed with mushrooms, meat, or sautéed cabbage for savory flavors, and with jam or cottage cheese and raisins for the sweet tooth. I liked the sweet ones best. I make these Sweet Crepes for breakfast every Sunday. They are so easy to make (Yes, EASY!) and so versatile. My husband loves these stuffed with Nutella, strawberries, and banana, and my toddler and I enjoy them as is. 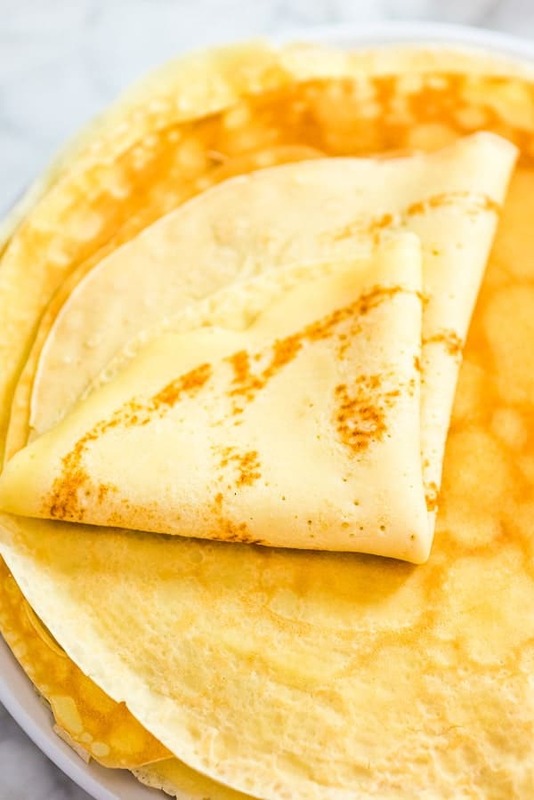 What fillings can you put in sweet crepes? 1.Mix well (or blend) all the ingredients together, excluding the butter. 2. Heat a lightly-buttered frying pan over medium-high heat. 3. Pour the batter onto the pan, using about 1/4 of a cup for each scoop. 4. 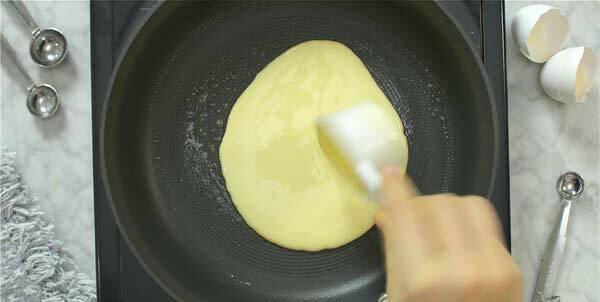 Tilt the pan and rotate it with a circular motion to help the batter spread evenly. 5. Cook for about 1 minute per side on medium heat. Repeat until the batter is finished. NOTE: While cooking crepes, you don’t have to grease the pan with butter for every single one. Grease it once just before cooking the first crepe and this should be enough. Use just a little bit of butter to prevent sticking. You may also choose to substitute butter with coconut oil. 1. You can make the batter ahead of time and store it in the refrigerator. Then, pan fry the crepes right before serving. 2. 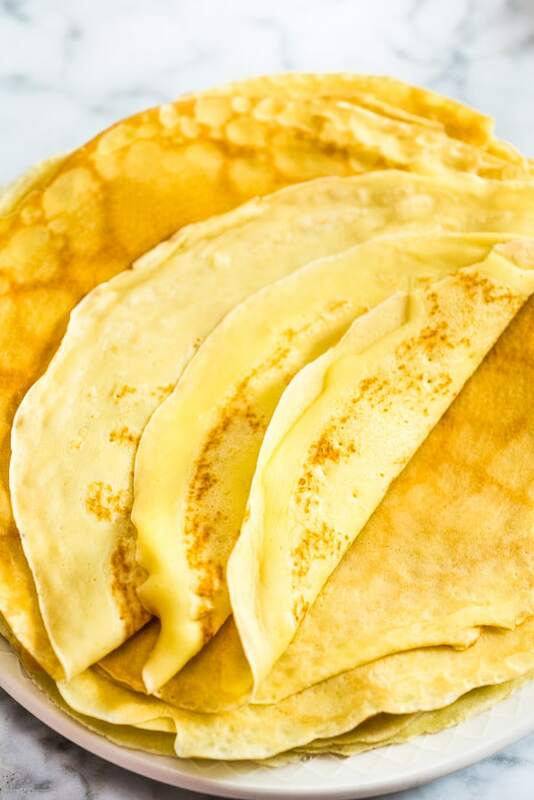 You can make the crepes, place them in an oven-proof dish, cover tightly with foil, and store them in the refrigerator. When ready to serve, place the foil-wrapped crepes in the oven, and bake for 5-7 minutes at 300ºF. Use a non-stick skillet to fry the pancakes! 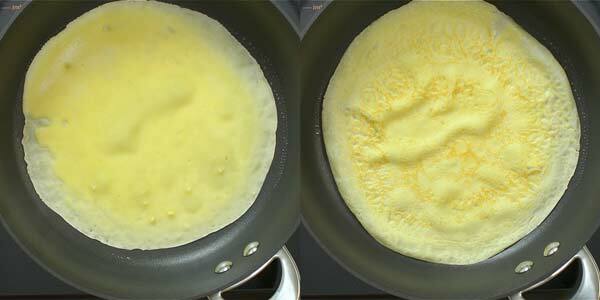 If your non-stick skillet has a lot of scratches, you might have trouble flipping the crepes. Don’t be afraid to use your hands to help flip the pancakes, if necessary. 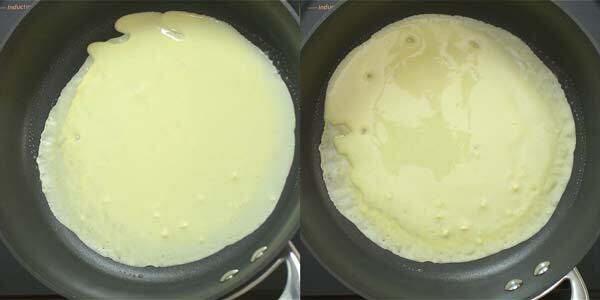 The best indicator that a crepe needs to be flipped is when the batter looks completely set, and no liquid remains. 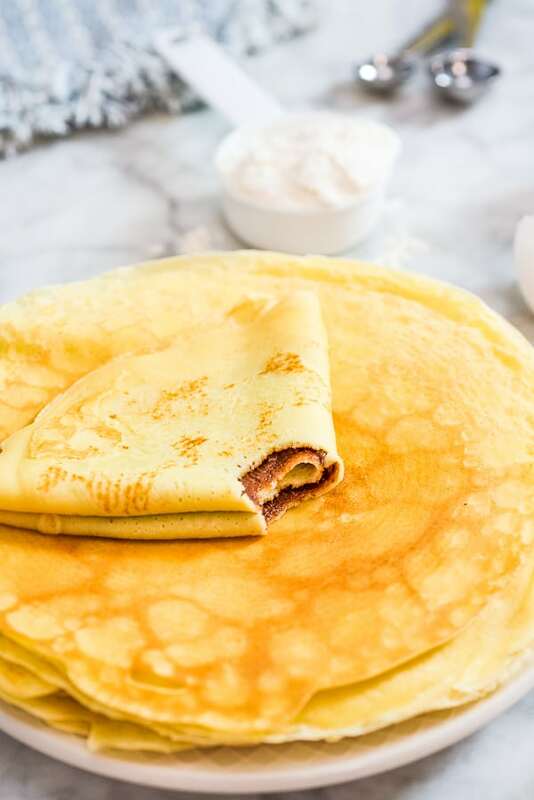 This Sweet Crepes recipe is simple, tasty, and works every time. Mix well (or blend) all the ingredients together, excluding the butter. Heat a lightly-buttered frying pan over a medium-high heat. Pour the batter onto the pan, using about 1/4 of a cup for each scoop. 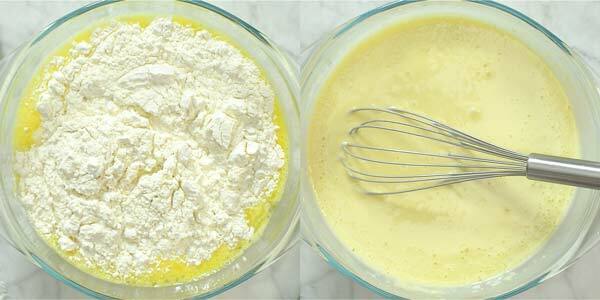 Tilt the pan and rotate it with a circular motion to help the batter spread evenly. Cook for about 1 minute per side on medium heat. Repeat until the batter is finished. While cooking crepes, you don’t have to grease the pan with butter for every single one. Grease it once just before cooking the first crepe and this should be enough. Use just a little bit of butter to prevent sticking. You may also choose to substitute butter with coconut oil. Crepes topped with whipping cream and fresh fruit add a side of bacon or ham and you’ve got a nice breakfast lunch or supper. Delish!!!! 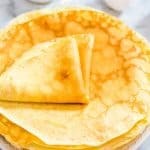 This is my favorite crepe recipe, as it is easy and is awesome to have with fruit or another sweet topping. Thanks, Julia! Yes, these pair really well with fruits, jam, and Nutella. These crepes look insanely good, Tania! Love filling mine with Nutella- so good. I love how fluffy and light they are! Perfect recipe. This is by far the BEST crepe recipe I have tried. Cooked up great and taste wonderful. 5 stars! Thank you so much, Bee! This crepe recipe looks so easy. I’m going to try it and make crepes with fruit. I made these yesterday for friends. I filled them with Nutella and crushed cookies! They disappeared instantly! 😀 Thank you! Thank you so much, Chrissie! Hi! Love the recipe and simple directions! My only issue is that they turned out really thick for crepes – I used gluten free flour that said sub 1:1 for regular flour but I feel like that might be not quite accurate. Have you made them gluten-free before?? Any suggestions would be helpful 🙂 thanks! Hi Jennifer! I have never made these with GF flour. Can you try adding less next time? Also, if the batter looks too thick you can add a splash of milk. Thanks! About how many crepes are estimated for one person? Hi Jasmine! Depending on the size of your frying pan, you’ll end up having about 12 8-inch crepes. The recipe estimates 6 crepes per person. For those that are allergic to honey how much sugar would you use in this recipe? Hi Holly! Use about 1 tbsp of sugar. Enjoy!! !